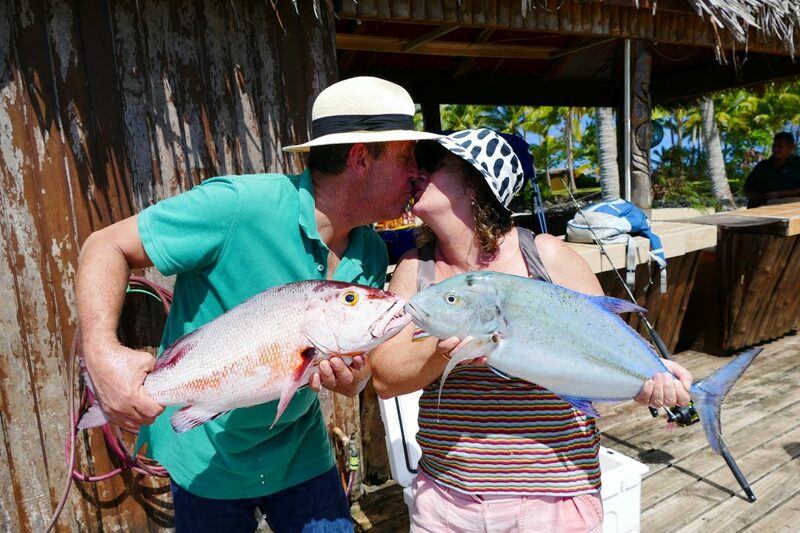 Kissing fish at Le Vasa! Giant Trevally on the run! 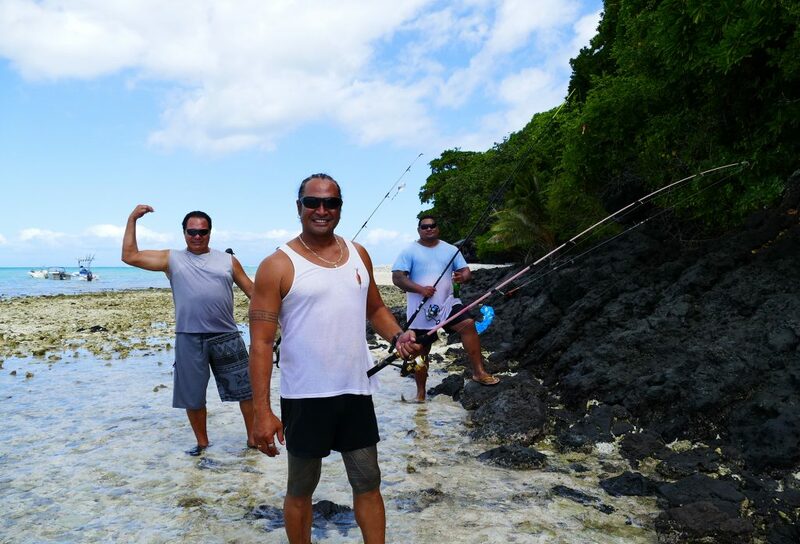 Fishing Charters with Fatu and awesome opportunity to hook into some good eating fish the famous GT. Mr. Bariller from France filled his bucket list today with a big catch the Giant Trevally, the fight was on nearly an hour until he reeled it in! Great Support from the Leatuafi Family who came along. 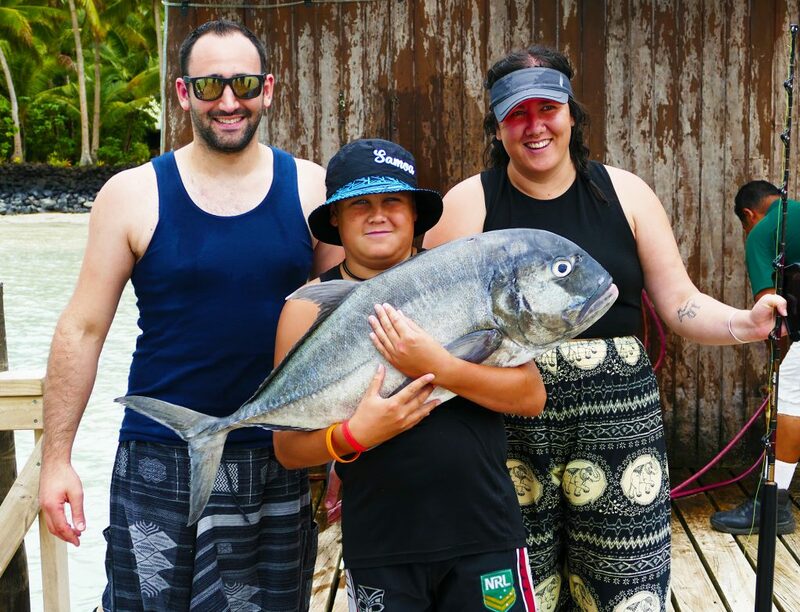 Thanks from the Le Vasa Team tight lines Fish on…..
Great opportunity if you have the chance while you are visiting Le Vasa ask if we have an Umu Show on! 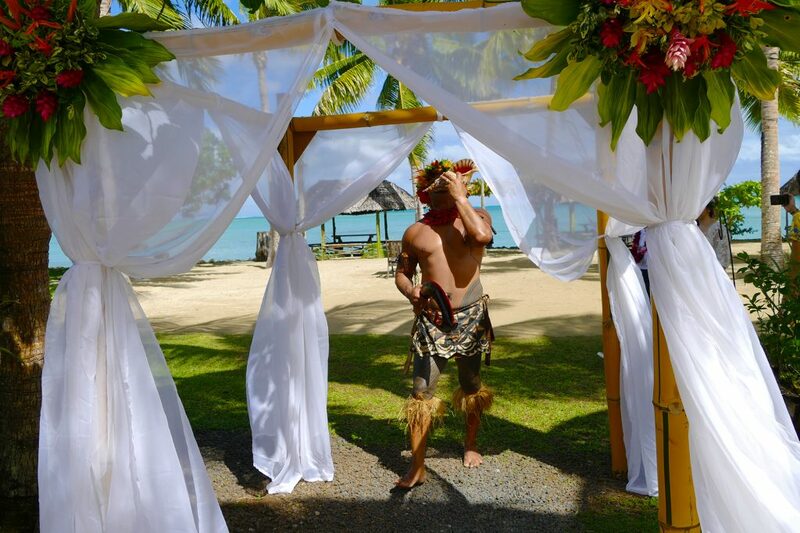 Come prepared dressed in a traditional lava and ula while you listen to the romantic songs of Samoa. 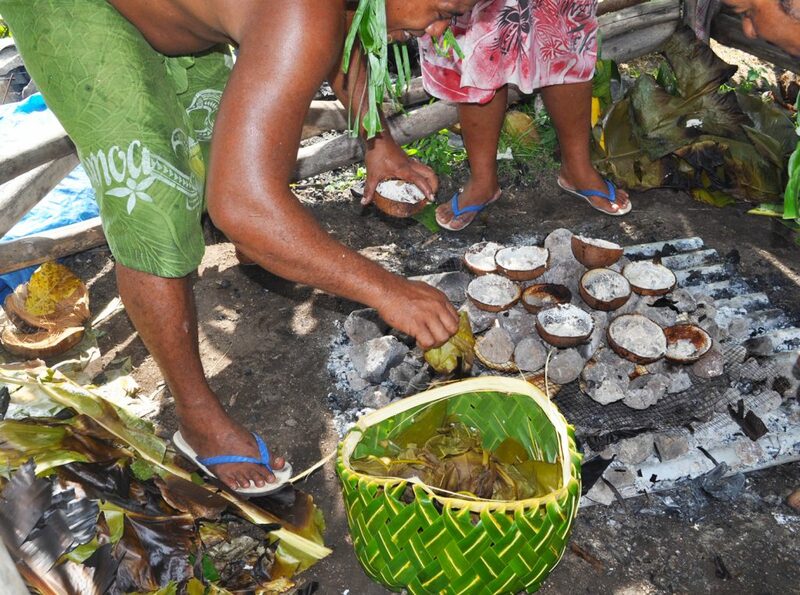 Enjoy the tasty treats of Samoan Cooking and try your hand at scrapping your very own taro. 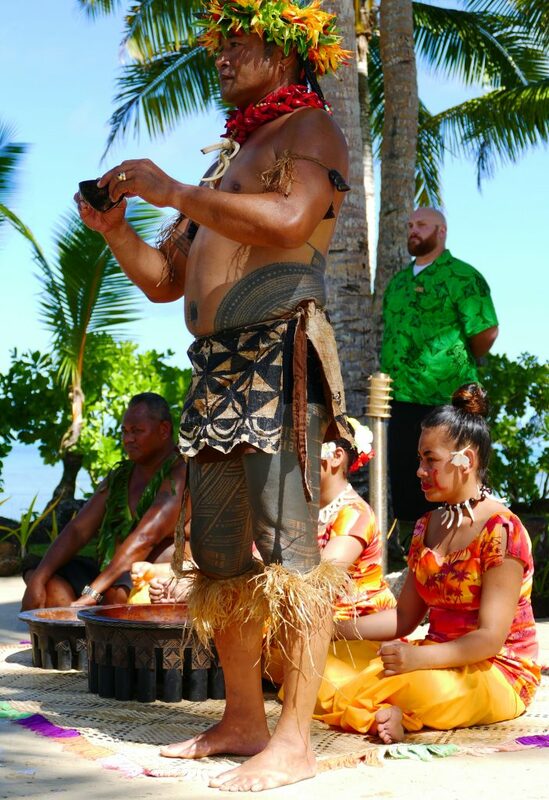 See Fatu demonstrate how to crack a coconut and tell tales of the legends passed down. Meet Romeo our resident horse! Le Vasa Resort Distinctly Samoan! A perfect day to be dining in one of these private oceanfront fales at Le Vasa Resort! 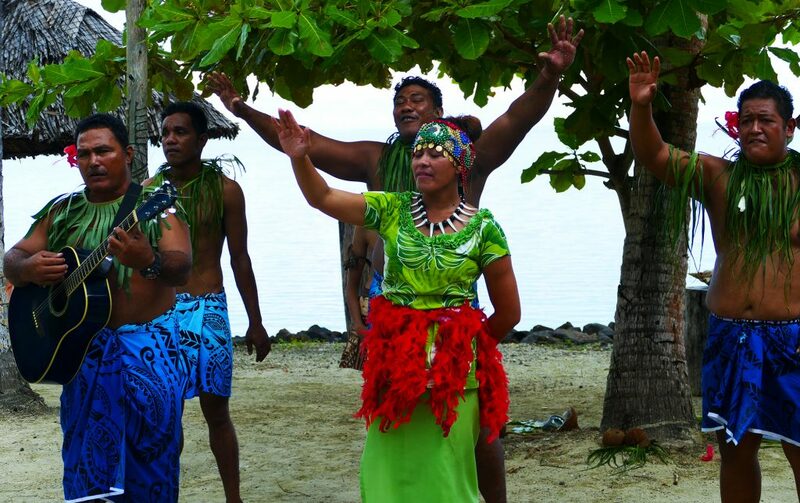 Take a break from your busy life, visit Samoa, Unplug and download a cultural experience. Taste the Fa’a Samoan way of life. 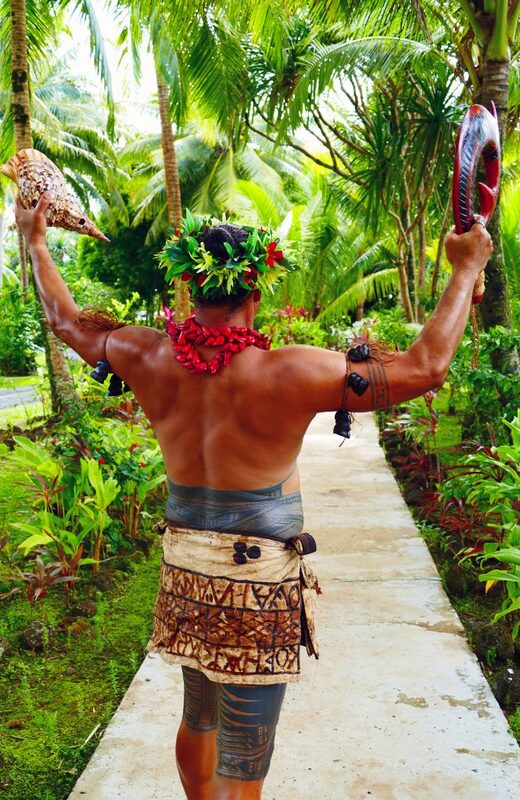 Samoan Warrior invites you to Le Vasa Resort! Is there any other place you would rather be? Blue Trevally what a catch! 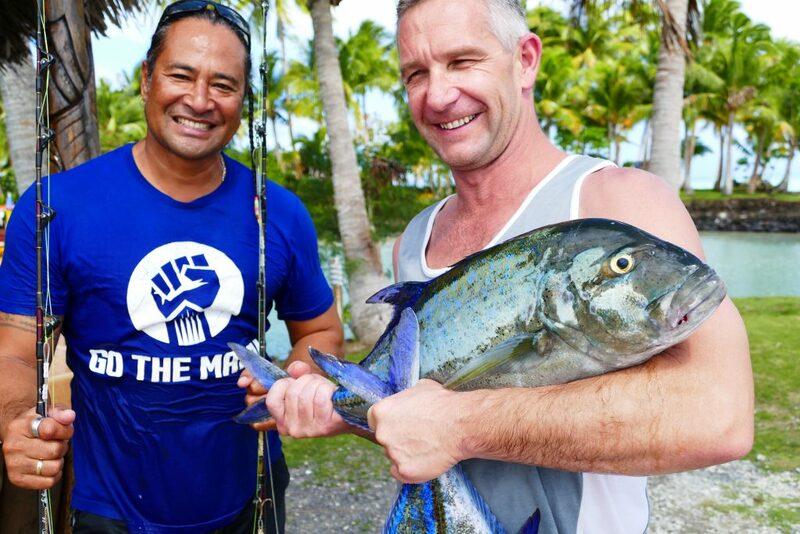 Open blue sea, excellent conditions to fish for Blue trevally at Le Vasa Resort! 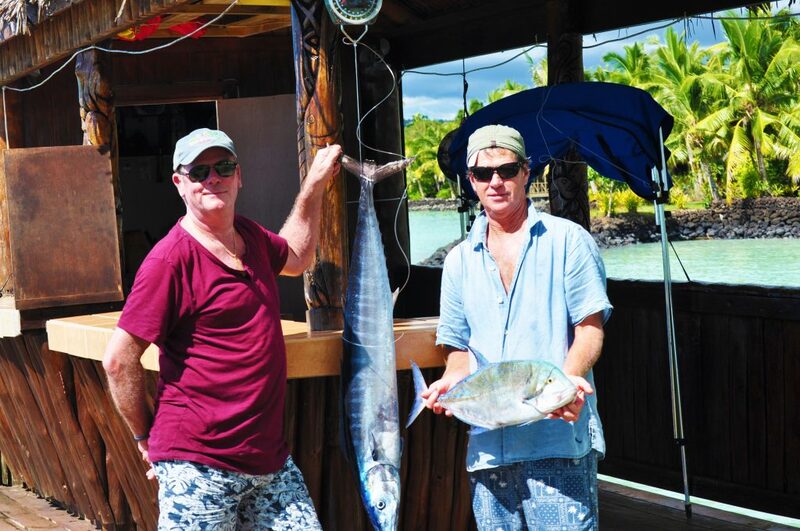 Chris a guest from Sheraton caught 2 beauties, blue trevally, good for Sashimi or to cook up a delicious feed! Big thank you for letting Le Vasa capture the moment. Fairy Tale Wedding, a day to remember. 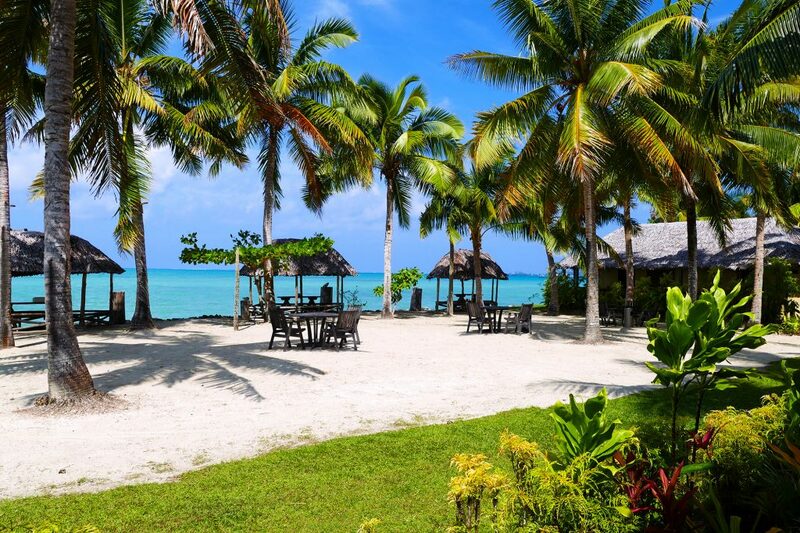 Le Vasa blends vibrant tropical flowers in the fore front of the stunning back ground of Manono Island. Marriage vows were at the Malietoa Monument. 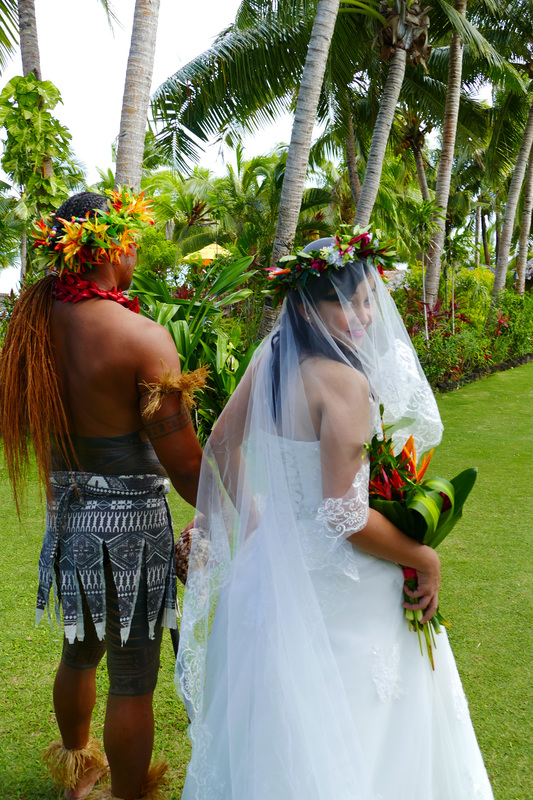 Throughout the day the couple were blessed with the sounds of the sea, sway of palm trees that touches your soul. The Couple Embarks into their future one step forward together at Le Vasa Resort. Cast a line, drink a cold local beer, and enjoy a fun fishing adventure. 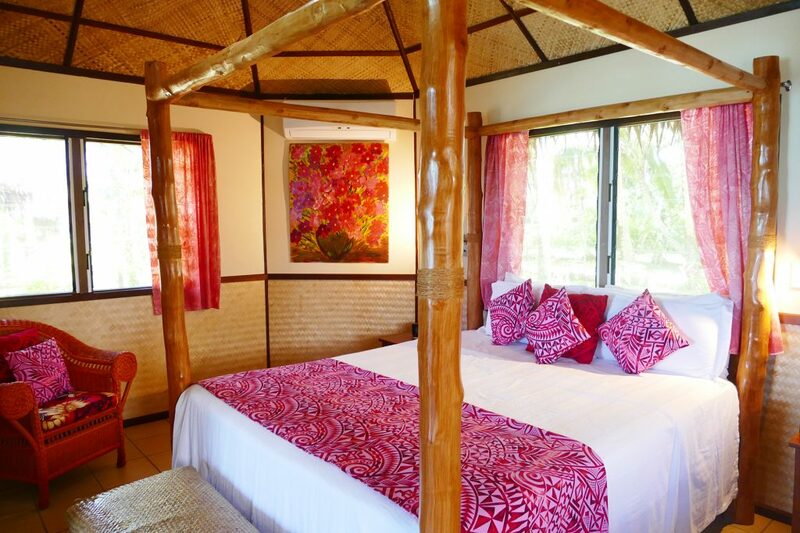 Le Vasa is surrounded by water rich in sea life virtually untouched, so get ready to go! 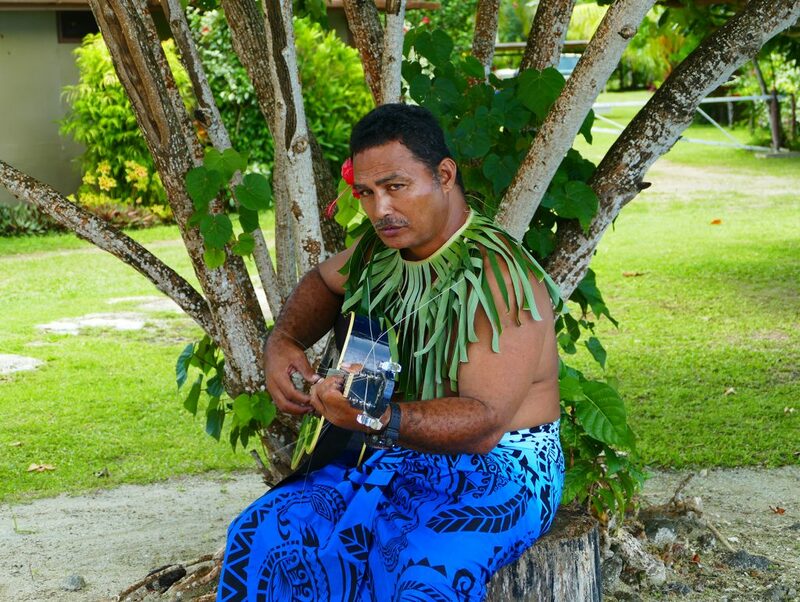 Ieremia Le Vasa Resort’s long time gardener serenades our guests while having lunch. Such a treat to sit back and relax by the sea, having a cool drink while listening to Samoan oldies. Thank you from the team at Le Vasa Resort! 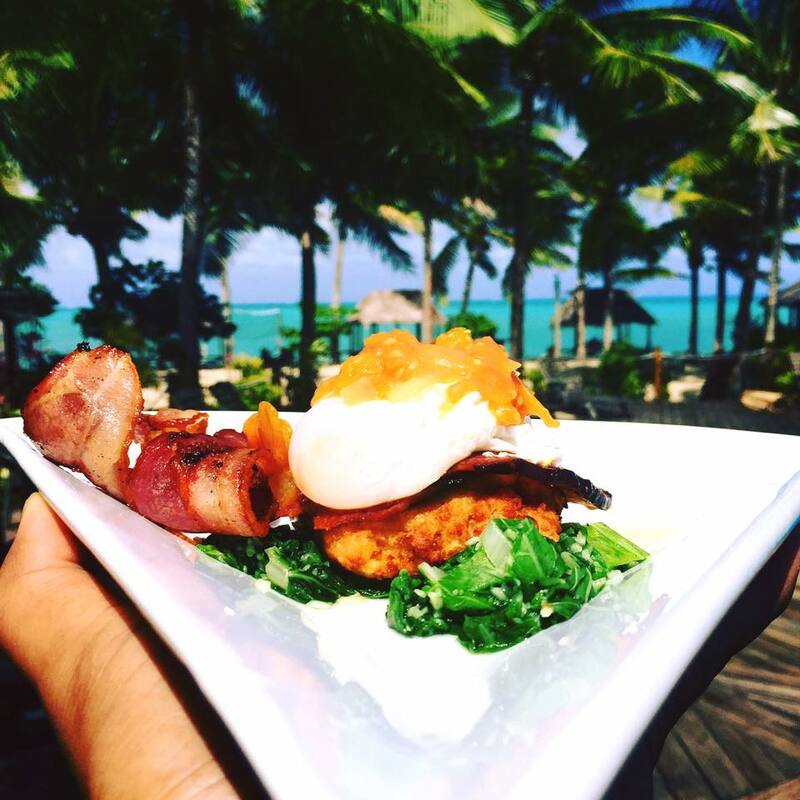 Booking direct you automatically receive a daily tropical breakfast and in addition we have a delightful menu that offers full breakfast choices of Eggs benie, omeletes, pancakes and much more, just ask your lovely waitress to assist you. See you in when the sunrises, we will greet you with a warm scrumpious breaky for the day! 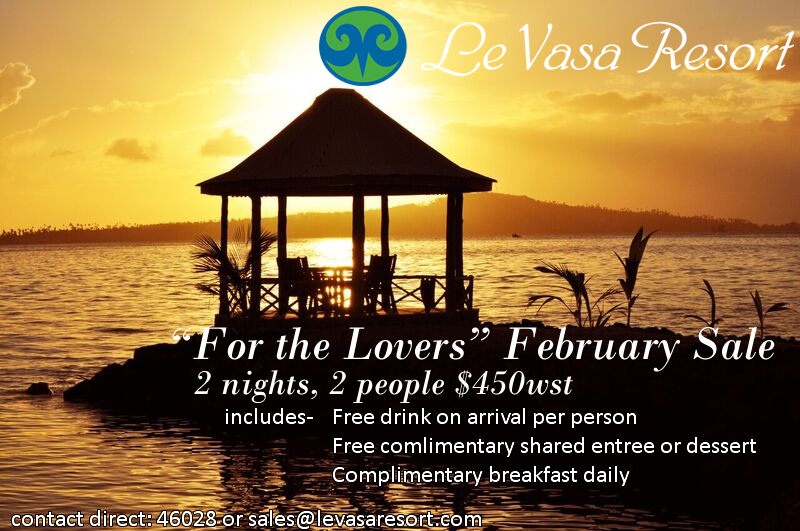 Break away and Unwind at Le Vasa Resort! 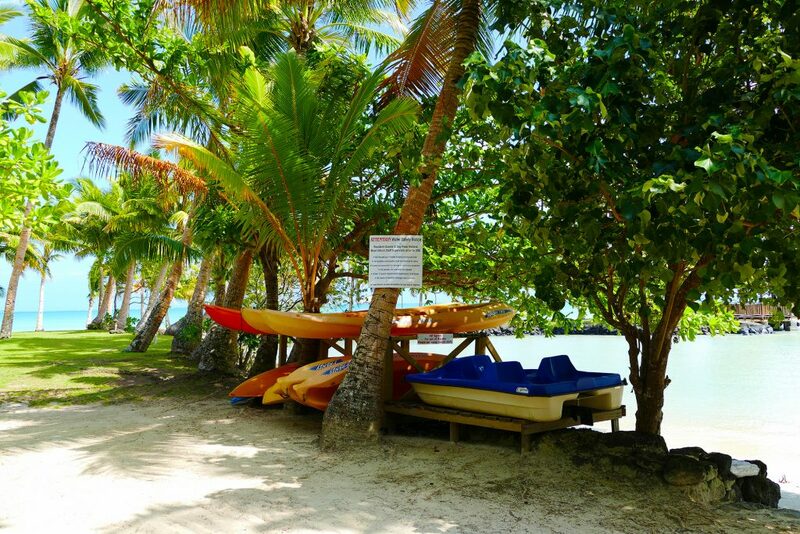 Enjoy the simple pleasures of life and grab a kayak, take it for a ride in the turquoise azure waters in front of the resort. 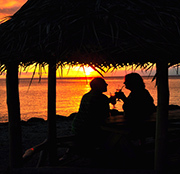 Might see a turtle or a sunset get in some downtime in Samoa at Le Vasa Resort. 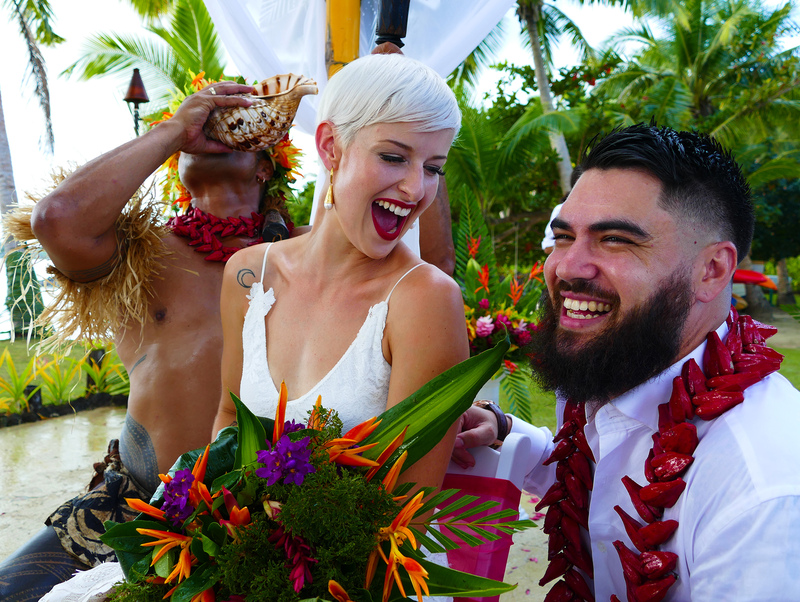 The couple fell in love and wanted to share their dreams in a tropical paradise at Le Vasa Resort, they travelled from Australia to elope. 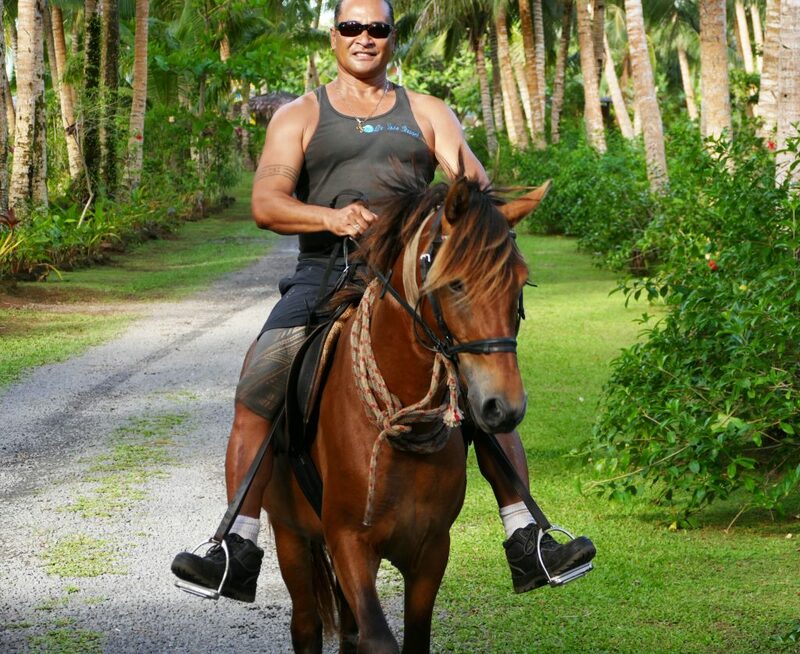 Rika was escorted by Le Vasa’s Samoan warrior to the beach. 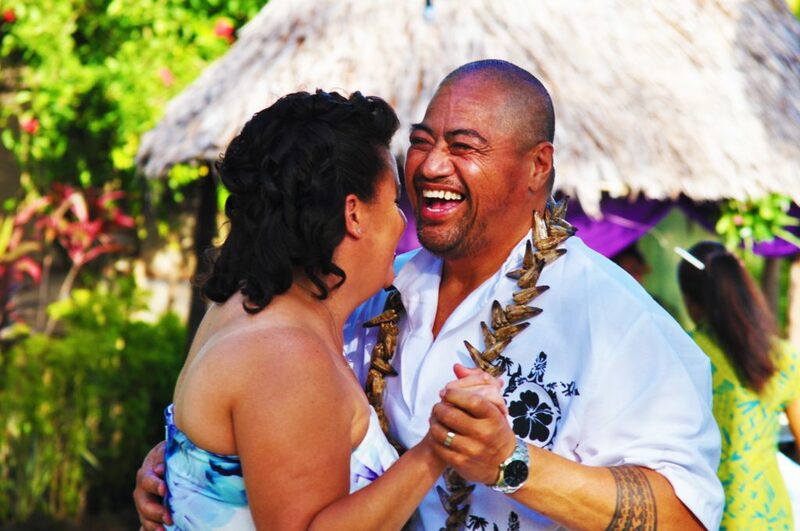 It was a perfect day, the sun shinning, gentle winds of the palms trees swaying made a magical memory for this couple. 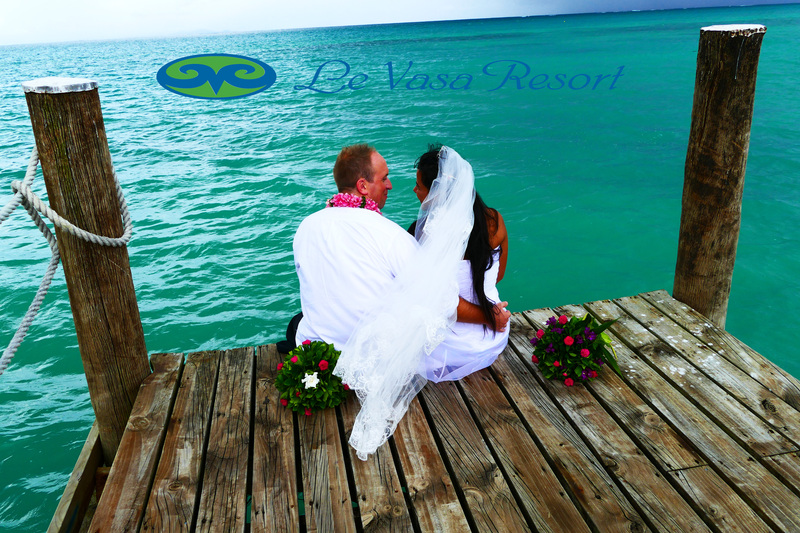 Le Vasa Resort is a great place to Elope, renew your vows or have a spectacular wedding day! Farewell to the Overseas travel agents who visited Samoa for the STE 2018 Fatu and the staff put on a great show for them! Everyone had a fantastic time, the Le Vasa team is looking forward to the many guests that will be sent by them! 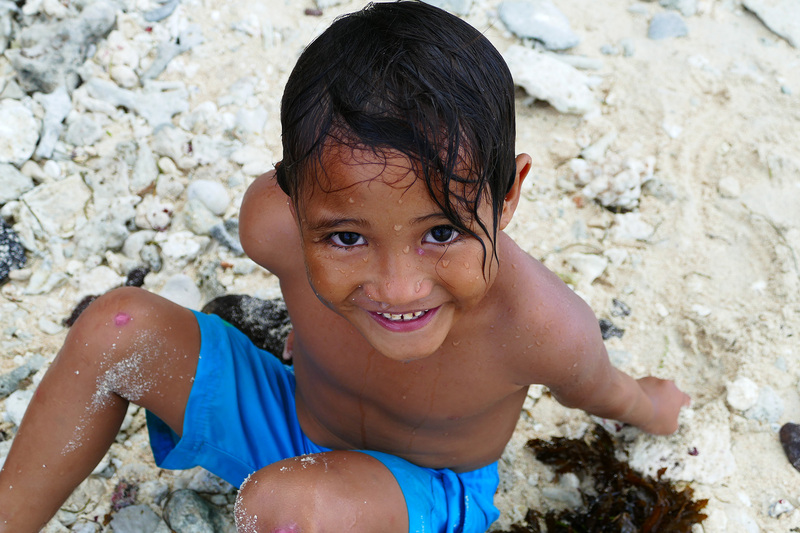 Finding your very own sea shells, and squishing sand in between your toes. Plan a fantastic day out with friends and family. Just what everyone needs an escape to Bat Island! Time to sooth the soul. 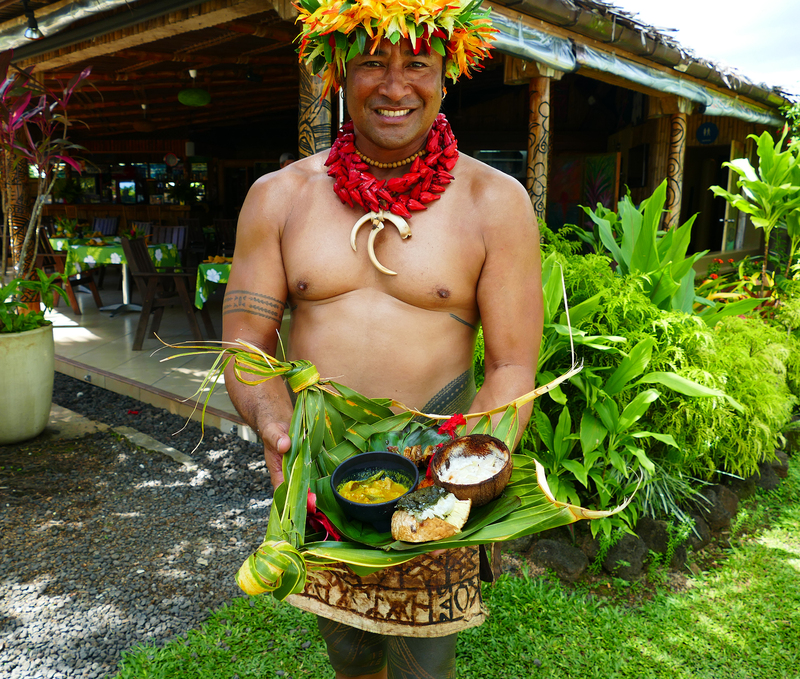 Wow, delicious Samoan food cooked with love, offered to the wholesale agents who visited us from Australia. Fatu AKA Antonio Bendars presented this tasty meal and even threw in a Samoan dance! Hubba Hubba everyone had a great time! 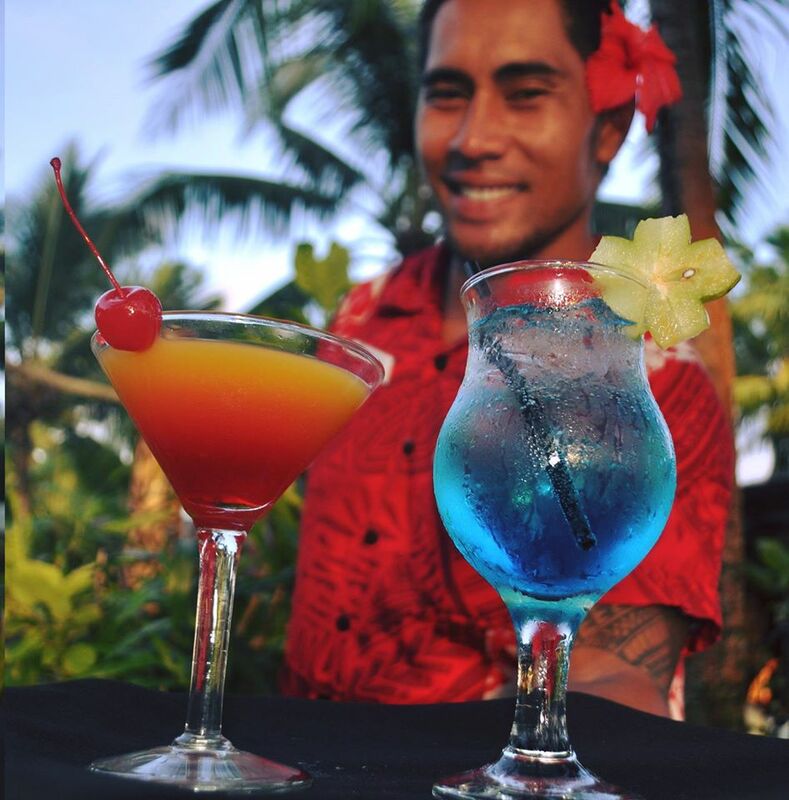 Island Time from 5:00 to 7:00 pm nightly, great time to mingle with other guests, watch the sunset and enjoy a tasty beverage! Ken at Cocolini’s by the Sea and the Ugly mermaid bar at Le Vasa Resort, will prepare you a yummy tropical cocktail. Love sailing, maybe water sports, we have it all here at Le Vasa Resort! Glide out and take in the sun, we have life jackets too, so never worry if you happen to fall in. 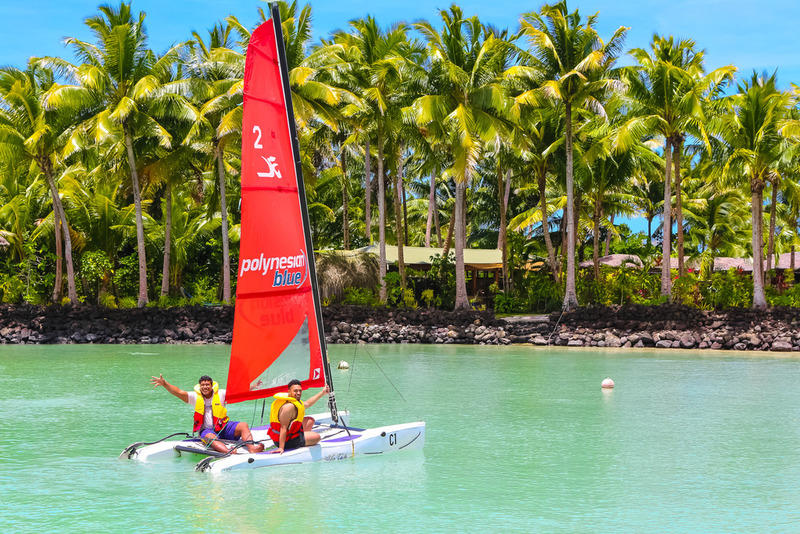 Let life blow over for a while and go sailing at Le Vasa Resort next time you are in the neighborhood. Some exciting things happening this week at Le Vasa Resort we have a new reception counter! Made of local hard wood polumuli base and a glorious slab of wood so shiny you can see yourself! In between guests the staff worked double shifts to make our entrance gorgeous! Be sure you check it out their good craftsmanship next time you visit at Le Vasa Resort. It was a last minute, simple wedding, decorated with magnificent colors of turquoise blue, white and gold to celebrate this day. 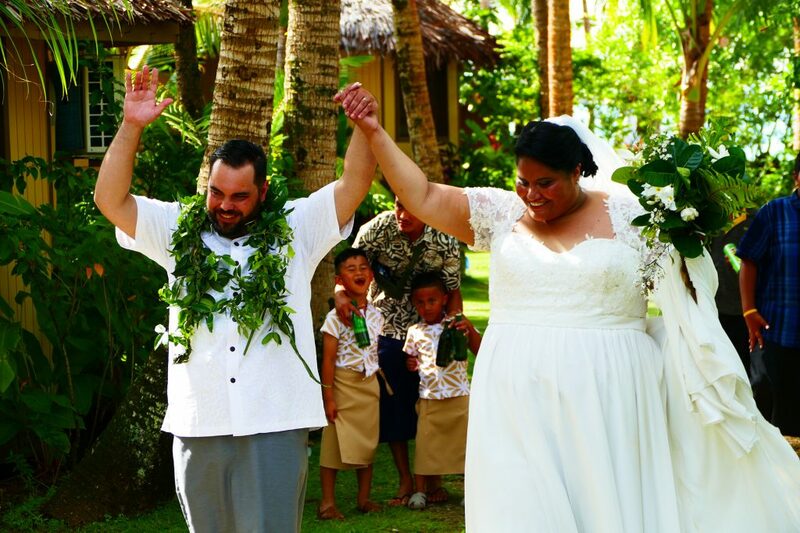 Jan and Hannah chose the gorgeous fale behind the Malietoa Monument to say their vows. Such an intimate place for their guests to embrace their step forward into the future. We here at Le Vasa were very grateful to be a part of their celebration and look forward to more weddings here this year! Susana and Petelo Iese Tie the Knot! Long overdue their 9 children wait for their parents to reach the alter, it was an amazing day! 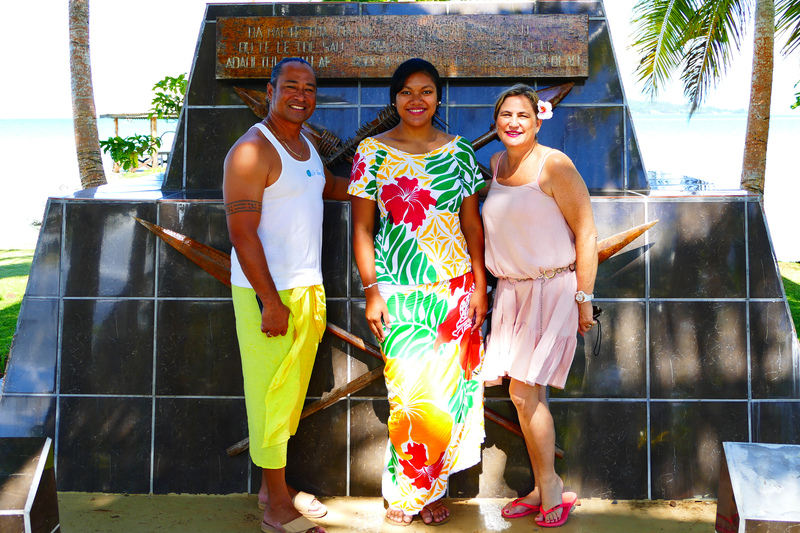 Brillant colors of bright yellow, pink and red adorn the venue at the Malietoa Monument. 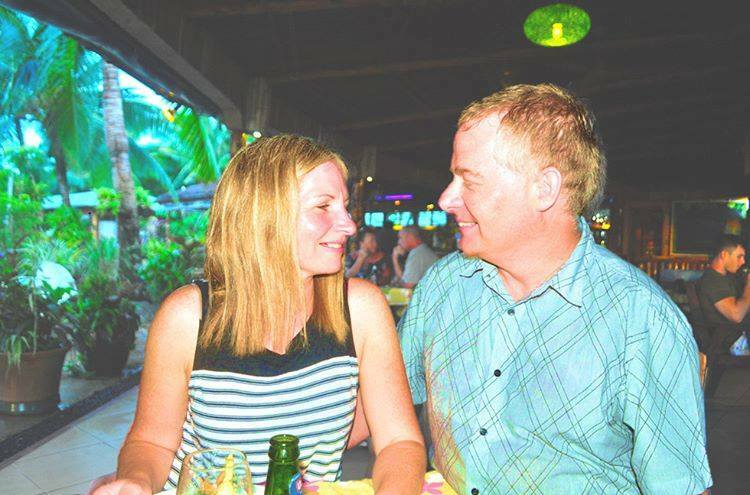 Le Vasa Resort Congratulates Mr. and Mrs. Mitchell. January 3rd a glorious day Janet and JD tied the knot. 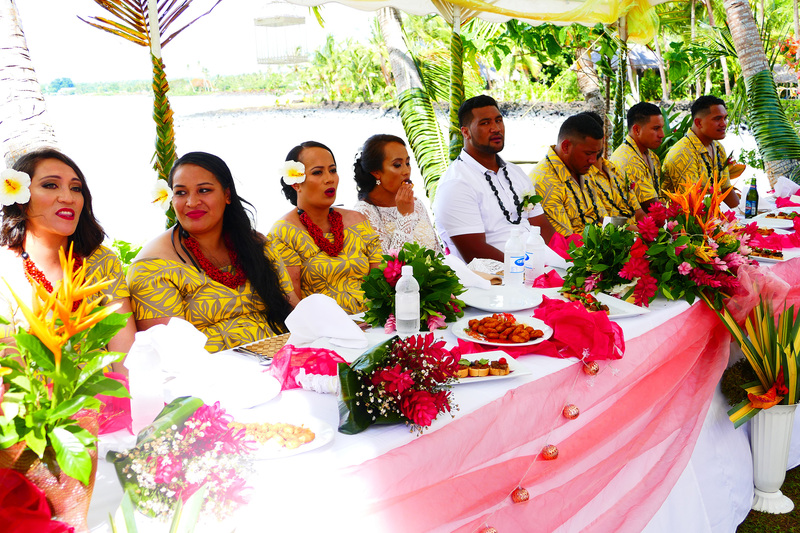 The Ceremony was at the Malietoa Monument and reception venue at the Beach area. The decorations were gold and white with pops of tropical flowers throughout absolutely stunning and classic style.😁 Thank you from the team at Le Vasa wishing you all the best for your future! Manono Island View from Le Vasa Resort..
Join us for a bit of activity or culture, check out Manono island when you stay at Le Vasa Resort. 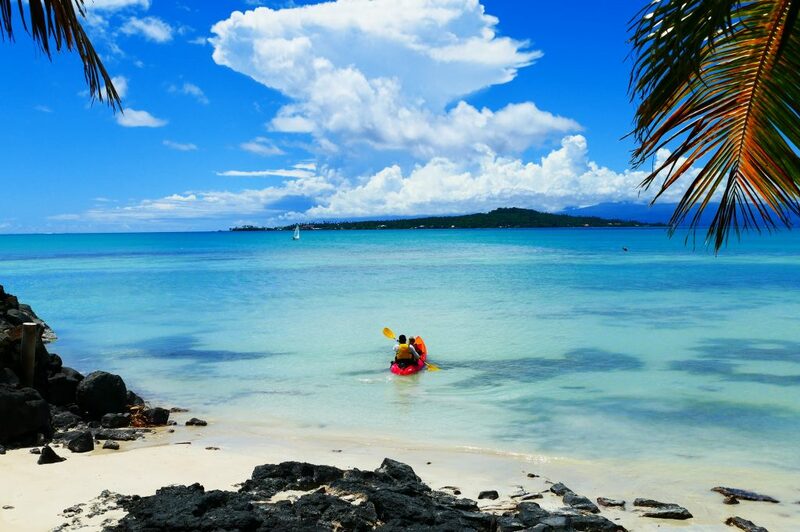 Take a kayak over, stop and snorkel on the way it’s loads of fun for the whole family. Great way to start off the New Year..
New Year Eve’s Party at Le Vasa Resort. Great night celebrating the eve of 2018 sharing the memories of 2017 dancing, laughing the night away. Most of the guests stayed up until 3 am in the morning, so it was a big hit! Thank you from the team at Le Vasa until next year! Join us in Celebrating the festive season with fire works, music, dancing, and much more. Dj Fah and Dj Pio will be here spinning their tunes at Le Vasa’s. post Christmas party the 26th of December 2017. Grab your tickets now before they are sold out only a few left. 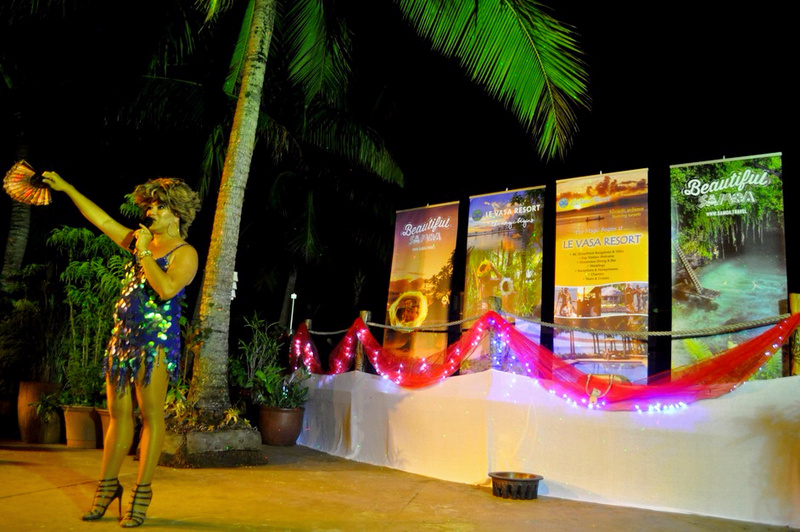 Surprise Visit from Miss Samoa..
Smart Auto Christmas Party at Le Vasa Resort. Sam Lei from Smart Auto, treated his staff to an authentic dinner, finger licking good Samoan food dished up in the traditional way. 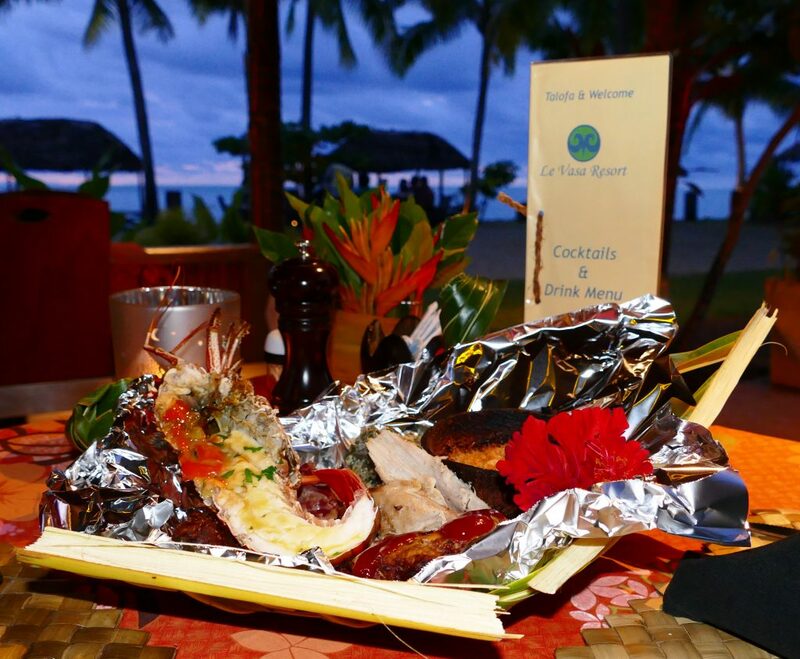 Pua (pig) Luau and Taro, chicken, Ula (cray fished) served in a mailo a coconut weaved basket. Celebrating the festive season, laughing all the way. Thank you from the team at Le Vasa. Email sales@levasaresort.com or call to book your party at Le Vasa Resort! Local Tattoo Artist makes Babydoll happy..
Local Artist from Manono freehand style designed Babydoll’s tattoo. So easy adn quick too, Babydoll asks if there was any local tattooist that could come over to the resort and do something special for her. This was Babydoll’s first freehand tattoo a stunning design on her body she had an awesome tattoo done of Samoa and a turtle. Memories to go home with in her wildest dreams she had no idea she was going to home with a piece of Samoa. EFKS Museum Christmas Party at Le Vasa Resort. It is nearly the end of the year when it’s time to celebrate after all the effort and hard work we all put into our careers and family. The Bar and Kitchen staff we ewre looking forward to decorate the venue for the EFKS party. It was a success, everyone had a fabulous time even our in house guests joined in dancing and celebrating. 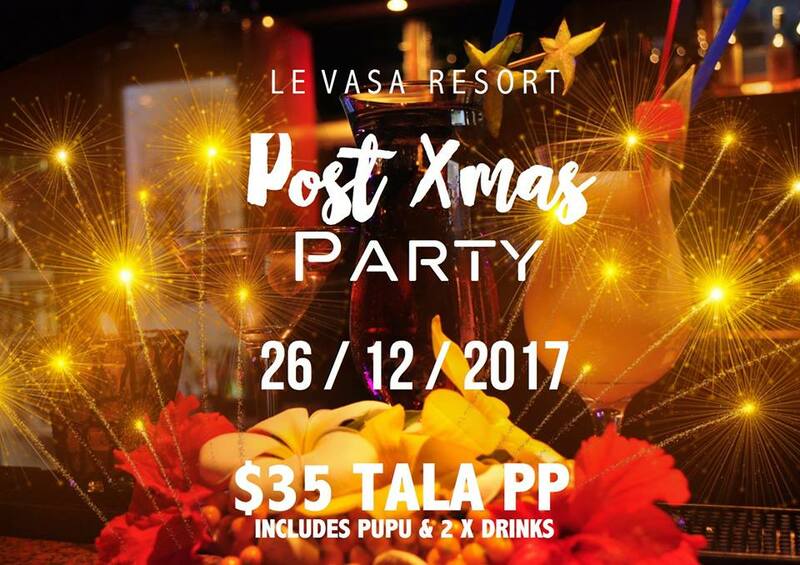 Email sales@levasaresort.com or call to book your Christmas party at Le Vasa Resort! 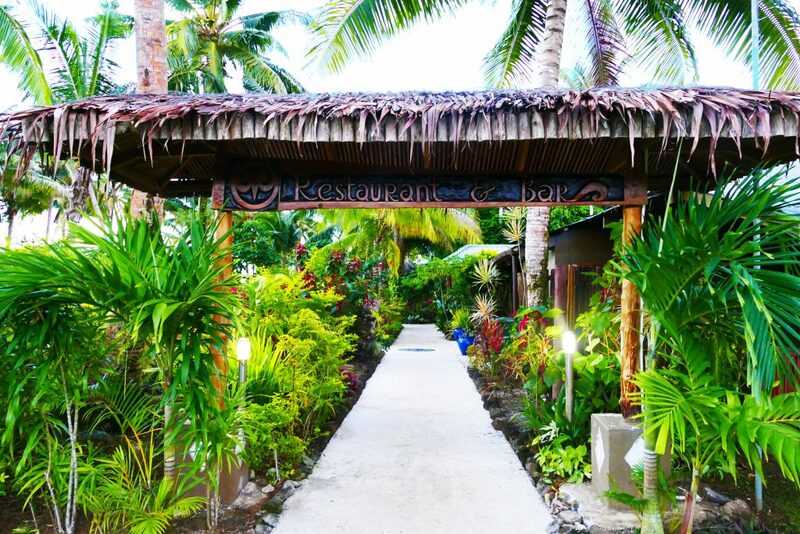 Our Eden Entrance, Time to Smell the Fragrance of Polynesian! Walk thru our pathway to our Tropical Paradise. 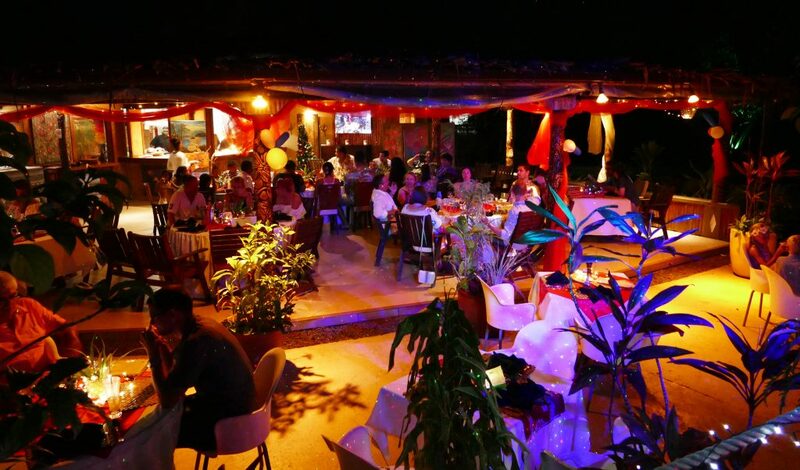 Lovely garden settings all around with vibrant lush flowers oozing out delightful fragrances of Frangini Pani, Gardenias and Teuila will cast a spell over you. 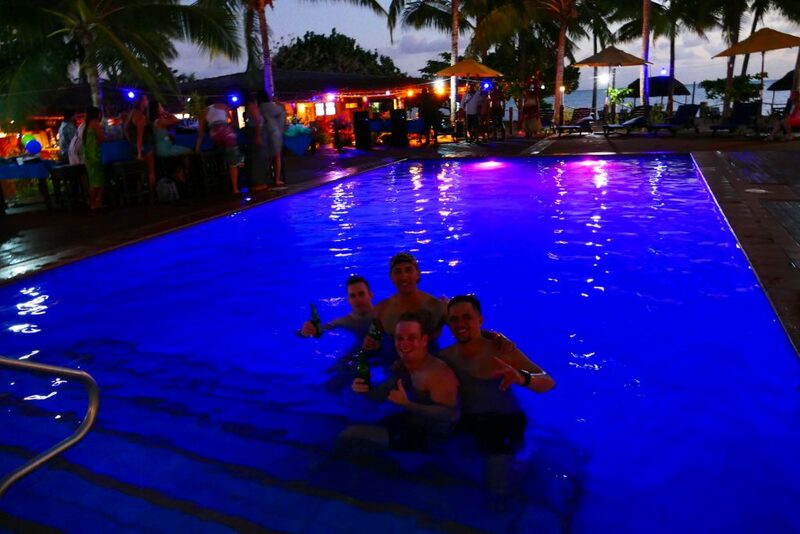 Great opportunity to have fun with your colleagues after a year of hard work and time to chill out by the pool at Le Vasa Resort. Sip your favorite beverage and listen to great music. 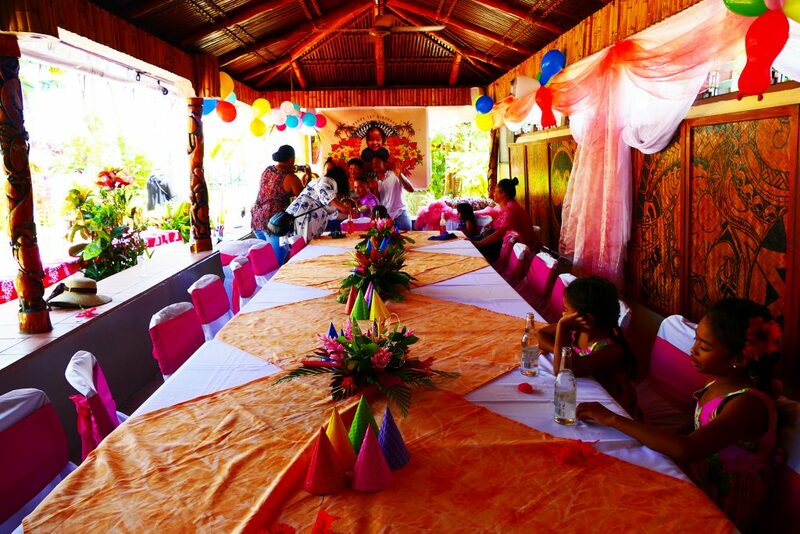 We look forward to catering to you and giving you the best Samoan hospitality! Email sales@levasaresort.com or call to book your private pool party at Le Vasa Resort! 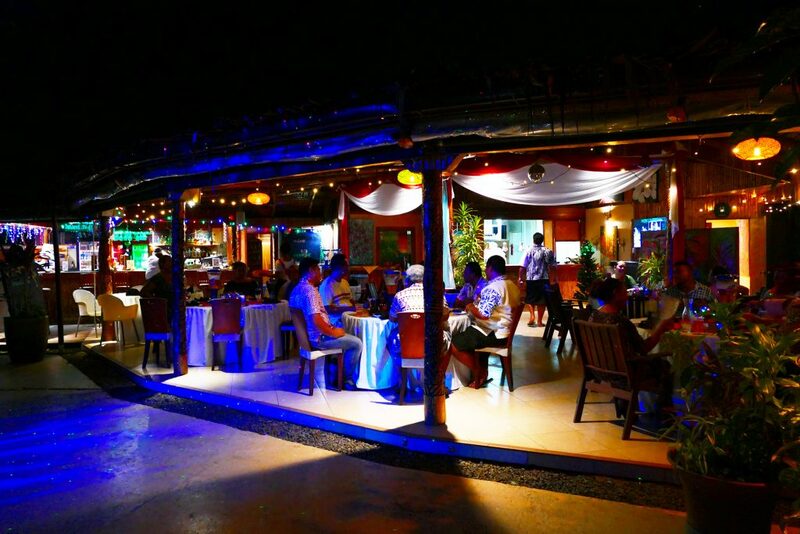 We walked down the path to the restaurant, Cocolins’s by the Sea, it was a magical place as you entered into the beautiful open area you could smell the freshly squeeszed coconut and sauteed herbs coming from the kitchen. We selected our seats near the garden looking out to the sea, as we held hands, we glanced into eachother‘s eyes and we knew we are going to have a fabulous time. Pink, Peach and white a little girls’s delight 1st Birthday party for little Mahalia Rose! Lollies all around fun for the kids and family, dip into the pool, play at the beach, join us for a delicious meal and divine cake at Le Vasa Resort. We look forward to decorating your event at reasonable prices and giving 5 star service! Email sales@levasaresort.com or call to book your birthday party at Le Vasa Resort! Today on our small fishing charter with Fatu, Craig & J caught a Wahoo and Blue Trevally! Looks like they will be eating well tonight. Thank you to everyone who participated in the Easter Hunt, and congratulations to everyone who won. 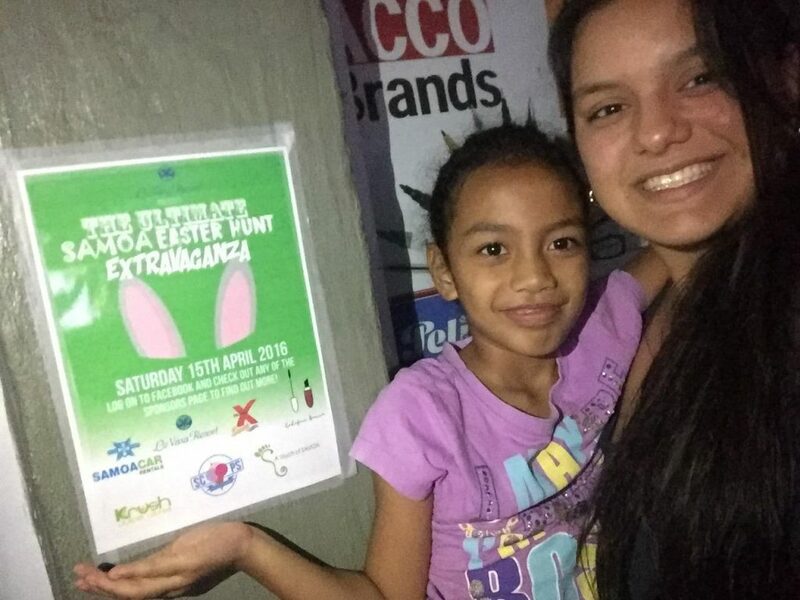 Huge congrats to Maria Sapatu who won the grand prize “1 x free Car rental for the day with Samoa Car Rental and 1 x night stay at Le Vasa Resort”. We look forward to hosting you and your daughter. 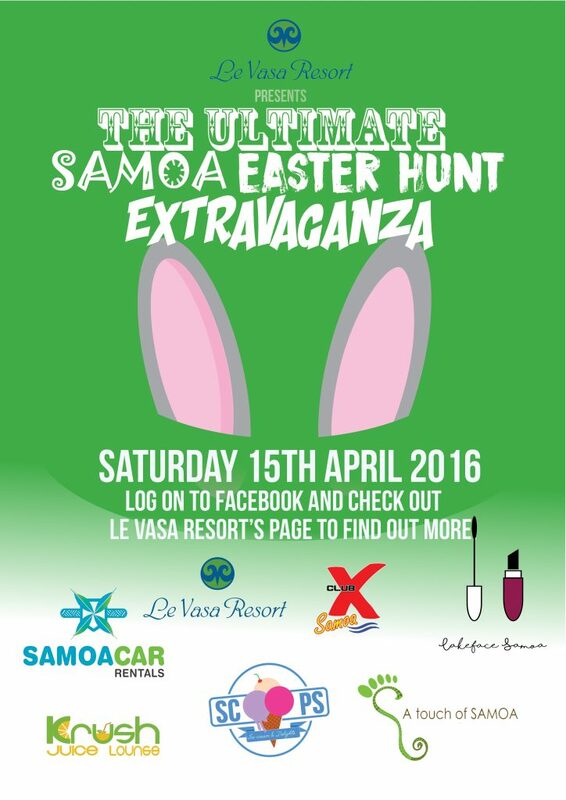 Le Vasa Resort will set out to create the Ultimate Samoa Easter Hunt Extravaganza over the weekend. 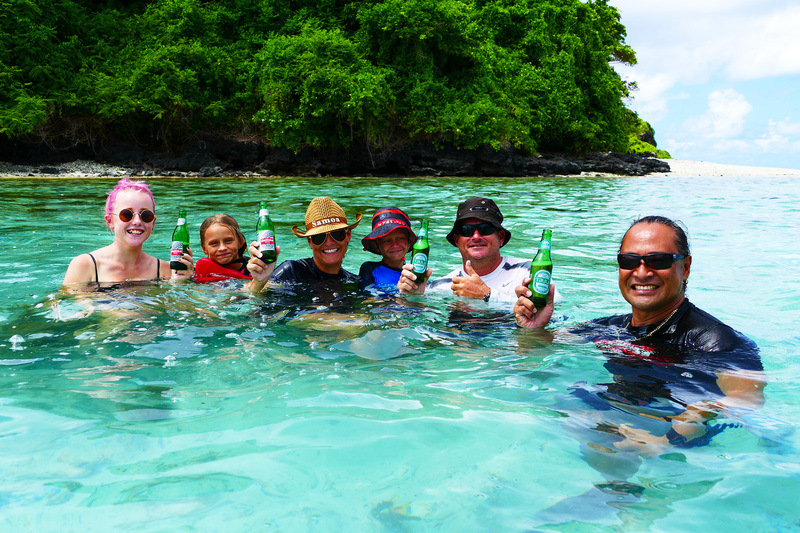 In collaboration with local businesses, people in Samoa will have a chance to win multiple prizes. Includes Free rental car, free night stay and much more. To enter, all you need to do is check out the Le Vasa Resort Facebook page for more information. Congratulations to Mr & Mrs Vagana on tying the knot. We wish you all the best with all your future endeavours. Thank you for choosing Le Vasa Resort to celebrate this new milestone. 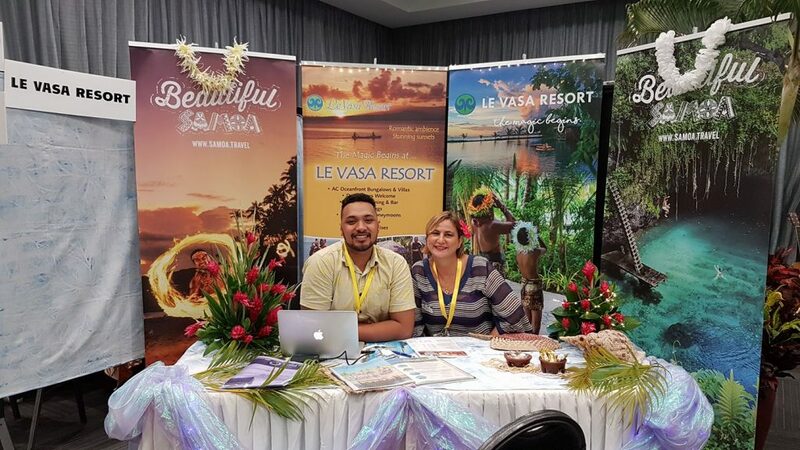 Le Vasa Resort attended the annual Samoa Tourism Exchange from the 3 – 5 April. An event that is held for local tourist operators to meet with overseas wholesalers. A significant event for Le Vasa Resort in obtaining new clienteles. 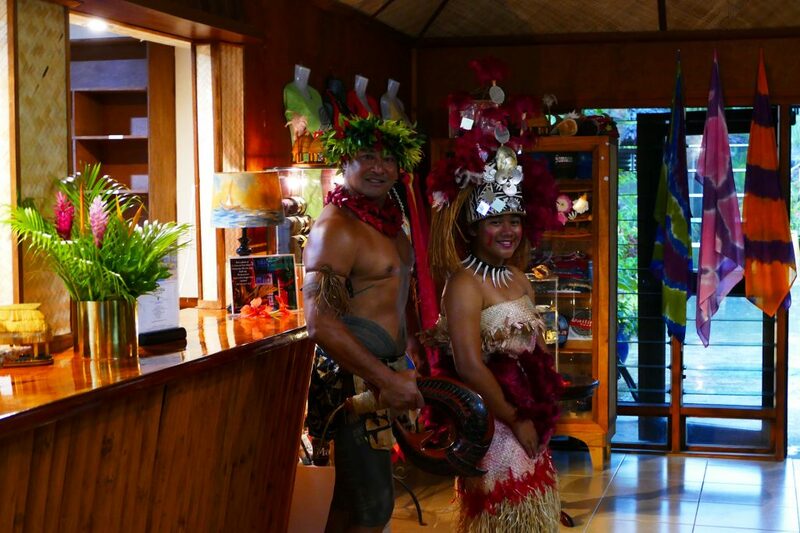 We had the privilege of hosting Cindy of Samoa and the famous Japanese comedian Imotodeeze at our Resort. Japanese TV filmed a Fafafine show at Le Vasa Resort. It was a night full of laughter, singing and lots of fun. © 2016 Le Vasa Resort. All rights reserved.